The founder and owner of a large cosmetics company, Janice Starlin (Susan Cabot), is disturbed when her firm's sales begin to drop after it becomes apparent to her customer base that she is aging. Scientist Eric Zinthrop (Michael Mark) has been able to extract enzymes from the royal jelly of the queen wasp that can reverse the aging process. Starlin agrees to fund further research, at great cost, provided she can serve as his human subject. 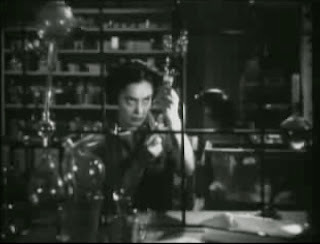 Displeased with the slowness of the results she breaks into the scientist's laboratory after hours and injects herself with extra doses of the formula. Zinthrop becomes aware that some of the test creatures are becoming violent and goes to warn Janice but before he can reach anyone he gets into a car accident. He is thus temporarily missing and Janice goes through great trouble to find him, eventually managing and then transferring his care to herself. Janice continues her clandestine use of the serum and sheds twenty years' in a single weekend, but soon discovers that she is periodically transformed into a murderous queen wasp. That's one serious royal jelly side effect! 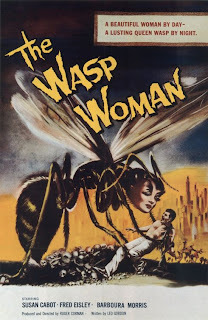 The Wasp Woman is currently in the public domain, so you can watch it for free on Google video. B-Movie Central points out some of the most obvious flaws in its science (and basic logic), but if you aren't going to simply sit back and revel in it's badness, it's just not worth watching. kept in such prolonged phase of 'SAMAADHI'-Transcendental meditative state-How is that Peggy ? Would you please tell me if the same idea has already been employed in sf by any one else ?And how do you look at this -a sheer absurdity or it really holds some water ?